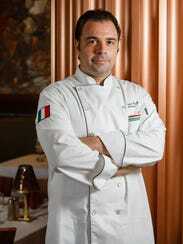 •Marco Coricelli, Osteria Celli, 15880 Summerlin Road, Unit 308, south Fort Myers. Marco Coricelli will open Osteria Celli today offering lunch and dinner service in the restaurant space formerly occupied by The Cookout. He will offer Italian cuisine with some Mediterranean dishes that are simple foods yet strives for authenticity, representing many different regions of Italy. Dishes will range from oxtail meatballs to porchetta to gnocchi with gorgonzola and speck. Patrons will find locally farmed products whenever possible on the menu, and some imported ingredients from Italy. Pastas will be made fresh daily in house and the menu will reflect what ingredients are in season.